Looking back at my time working within manufacturing a predominant recurring theme was the importance of the cost of quality throughout teams working on the various stages of construction. Sometimes seeming like a futile task, staff members would push blame onto the previous process, continuing to build upon the mistake and creating a poor overall outcome/quality of product. The “Well would you buy it?” phrase recited by managers as the fundamental way of purveying the importance of quality to staff had poor adoption. Staff members carrying out the construction of a product had no real concept of the overall value of the product and the role they played in delivering value to both internal and external customers. While education and keeping staff members up-to-date on new products and their use is a great start to communicating the importance of their efforts. They still lacked a concrete standard of quality, meaning staff members were still unsure when it came to making a decision on the impact of the imperfection. Quality standards often appeared as long specification type documents with pictures of various scuffs, scratches and chips. The literal explanation of the quality documents such as “…this scuff is unacceptable..” was only relevant to the mark depicted. While this may weed out the potential imperfections caused by mechanical processes such as something like dirt transferred from rollers, indents left from a clamping process, this left outlying issues yet to be documented. 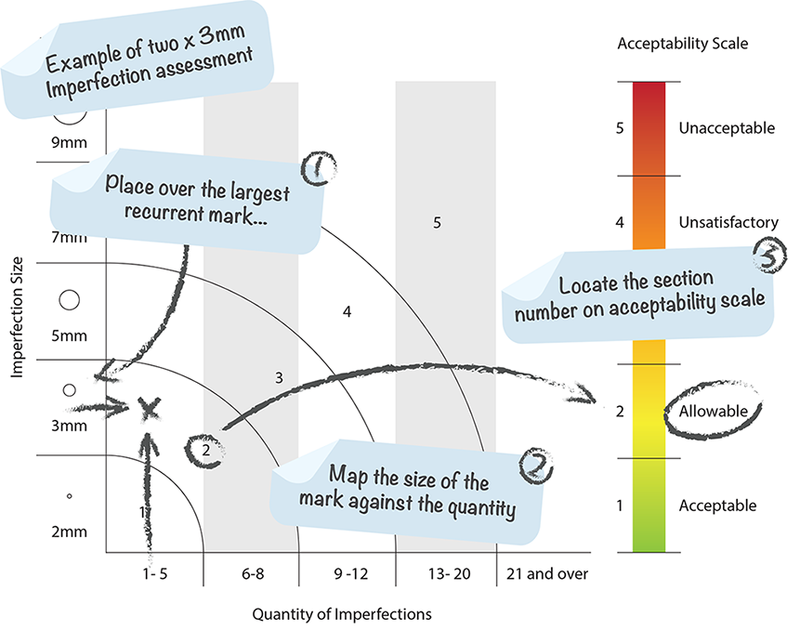 While these sorts of marks need to be captured and may be represented in your Key Performance Indicators (KPI’s) they shouldn’t be around for long as they can be tackled with either amendments to the process/work instruction or a greater importance placed on the upkeep such as 5s checks. Looking at the issues outlined above I have made an attempt to come up with an easily adaptable tool that after an initial training period can be applied at each of the various stages involved in the manufacturing process by all members of staff. While a meeting about what your own acceptance criteria is, e.g. an area of the product that is only visible during installation may have a less rigorous quality criteria. After the amendments have been made to the template the tool should give you the ability to quickly gather the metrics you need for a further root cause analysis of the most predominant issues. The tool, ideally printed on clear acetate, is much more robust than paper documents even if they have been laminated. Clear acetate also allows the sizing guide along the right hand side of the chart to be placed directly over the imperfection. As well as allowing it to be easily wiped clean if it comes into contact with grease, oil, or other transferable dirt that may be present as a result of the manufacturing process. Place sizing circles over largest recurrent imperfection. Move right along the chart to the quantity of imperfection present. Reference the number within the radial section of the chart on acceptability scale to gage the severity of the imperfections. The configuration of the tool in the standard download available here uses a uniformed radial pattern. But can be amended over time taking advantage of valuable staff feedback to better reflect the imperfections discovered via day to day use. The tool is available in an .SVG meaning the alterations can be made through the use of free vector graphics software (Inkscape) You can also download a .pdf document with a layer for training that can be turned off before printing if you would like to use the tool in its as is format. Having all members of staff actively involved in the quality process allows quality control to become an integral part of the manufacturing process. Quickly capturing overlooked issues as well as ones that may arise in future makes staff at all levels see the value their work creates for the next actor in the chain of events, resulting in better adoption and a better outcome for the end users.